Definition at line 26 of file CLGradientBase.h. Definition at line 29 of file CLGradientBase.h. Definition at line 29 of file CLGradientBase.cpp. Definition at line 41 of file CLGradientBase.cpp. Definition at line 54 of file CLGradientBase.cpp. References addGradientStop(), mSpreadMethod, PAD, REFLECT, and REPEAT. Definition at line 86 of file CLGradientBase.cpp. Adds a copy of the given GradientStop object. Adds a copy of the given CLGradientStop object. Definition at line 162 of file CLGradientBase.cpp. References CCopasiVector< T >::add(), and mGradientStops. Referenced by CLGradientBase(), and CCopasiXMLParser::GradientStopElement::start(). Adds gradient base attributes to the gradient passed as the argument. Definition at line 194 of file CLGradientBase.cpp. References mGradientStops, mId, mSpreadMethod, REFLECT, REPEAT, and CCopasiVector< T >::size(). Referenced by CLLinearGradient::toSBML(), and CLRadialGradient::toSBML(). Definition at line 152 of file CLGradientBase.cpp. Returns a pointer to the gradient stop with the given index or NULL if the index is invalid. Definition at line 135 of file CLGradientBase.cpp. References mGradientStops, and CCopasiVector< T >::size(). Referenced by CLGradientStops::CLGradientStops(), getLinearGradient(), getRadialGradient(), CLLayoutRenderer::map_gradient_color(), CCopasiXML::saveGradientElements(), and CLLayoutRenderer::update_colors(). Returns a const pointer to the gradient stop with the given index or NULL if the index is invalid. Definition at line 144 of file CLGradientBase.cpp. Definition at line 178 of file CLGradientBase.cpp. 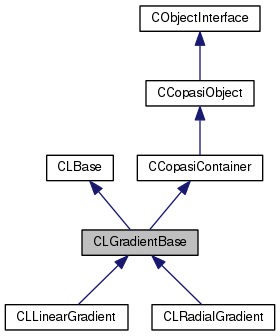 Referenced by CLRenderResolver::fill_base_maps(), CLRenderFlattener::flatten(), and CCopasiXML::saveGradientAttributes(). Definition at line 170 of file CLGradientBase.cpp. Returns a pointer to the gradient stop vector. Definition at line 118 of file CLGradientBase.cpp. Returns a const pointer to the gradient stop vector. Definition at line 126 of file CLGradientBase.cpp. Returns the number of gradient stops. Definition at line 110 of file CLGradientBase.cpp. Returns the spreadmethod of the gradient. Returns the spreadmethod of he gradient. Definition at line 94 of file CLGradientBase.cpp. Referenced by getLinearGradient(), getRadialGradient(), CLLayoutRenderer::map_gradient_color(), and CCopasiXML::saveGradientAttributes(). Sets the id of the object. Definition at line 186 of file CLGradientBase.cpp. Referenced by CCopasiXMLParser::LinearGradientElement::start(), and CCopasiXMLParser::RadialGradientElement::start(). Definition at line 102 of file CLGradientBase.cpp. Definition at line 42 of file CLGradientBase.h. Referenced by addGradientStop(), addSBMLAttributes(), createGradientStop(), getGradientStop(), getListOfGradientStops(), and getNumGradientStops(). The gradient base needs an id in addition to the key. The id corresponds to the id in the SBML render extension and it does not have to be globally unique. As a matter of fact, it is sometimes needed that gradient base of different render information have the same id. Definition at line 55 of file CLGradientBase.h. Referenced by addSBMLAttributes(), getId(), and setId(). key string for the gradient. Definition at line 47 of file CLGradientBase.h. Referenced by CLLinearGradient::CLLinearGradient(), CLRadialGradient::CLRadialGradient(), getKey(), and ~CLGradientBase(). Definition at line 41 of file CLGradientBase.h. Referenced by addSBMLAttributes(), CLGradientBase(), getSpreadMethod(), and setSpreadMethod().